Yesterday we ran Boomwhacker music workshops at St. Giles and St. George’s Primary school in Staffordshire. We recently ran an African drumming workshop at their school in January, so it was a pleasure to come back and work with the children and staff again. 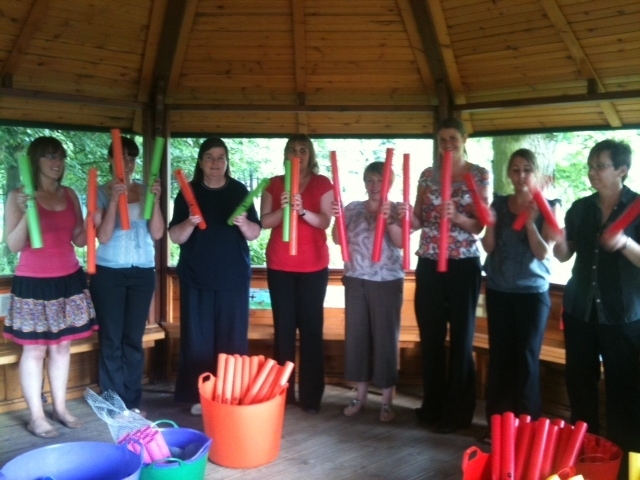 The day finished with a special Boomwhacker teacher training session for the staff. Our Boomwhacker workshops are about leaving a legacy long after we have gone. Not only do we inspire the children with the sound of Boomwhackers but we equip schools with a full set of Boomwhackers for the whole at a very low cost and make sure that the training gives teachers the means to continue the work after we have gone. The weather was hot and humid and we were concerned that running an after school training session for a group of tired teachers in their hot and stuffy hall might just turn everyone into melted jelly! Fortunately the school had a wonderful resource - an open air classroom situated in a beautiful natural garden in the school grounds. The acoustics were prefect and as a result all the staff managed to fully participate in the tasks to create a fantastic sound. The recording below shows what the session sounded like at the end!